Christiaan Rudolph de Wet, 7 October 1854 - 3 February 1922. Bothaville, an action during the Second South African War, fought on 6 November 1900 around Doornkraal farm eight kilometres south of this town in the Orange Free State, between a Boer commando under General Christiaan de Wet and British forces commanded by Major-General C.E. Knox. During the previous afternoon, patrols from a mounted column led by Lieut.-Colonel P.W.J. Le Gallais had picked up the Boers' trail some sixteen kilometres east of the town and began following it. On nearing the village (which had been destroyed during an earlier British visitation), the troops came under fire from Boer guns positioned south of the Valsch River. Approaching darkness, however, prevented any action to follow up the enemy more closely until the next day. Resuming their saddles at 4 a.m., Le Gallais' troops crossed the river and were steadily advancing south when at 5.30 a.m. the leading element stumbled across a Boer picket of five men fast asleep; these were captured, without a shot being fired. Realising that the enemy laager (camp) was close by, the officer in command despatched a message for the column's guns to be sent forward before leading the 70 men with him forward at the gallop to a low hill to their right front. On gaining this ground, the main Boer camp was found to lie no more than 300 metres beyond. Immediately taking up position along the crest, the troops opened a rapid fire with their magazine rifles into the sleeping laager, taking its occupants completely by surprise. The majority of the Boers made no resistance but simply leapt upon the nearest available horses and fled, among them de Wet and President M.J. Steyn. Some 130 of the enemy were unable to find mounts, however, and took shelter behind the low stone wall of the farm's garden in an attempt to defend their own guns and camp equipment. The arrival of additional troops soon brought the number on the British side up to about 170, but this was none too many when de Wet began rallying his men who had escaped the commencement of the attack and began harrying the British flanks. A four-hour engagement followed, which only ended when Knox reached the scene at the head of another mounted column commanded by Lieut.-Colonel H.B. De Lisle which included the New South Wales Mounted Rifles under Colonel G.C. Knight and West Australian Mounted Infantry. 'But at the first flash of the steel a white flag went fluttering up, and amid the shouts of the victors, the Boers held up their hands and surrendered'. They Boers had lost at least seventeen men killed in the action, along with 114 taken prisoner (of whom seventeen were wounded); British losses amounted to 38 killed and wounded, among them Le Gallais who died of wounds that night. Serious losses of materiel had also been inflicted on the enemy, including six field-guns, a Maxim and a pom-pom, all de Wet's wagons carrying gun and small-arm ammunition as well as clothing and other supplies. Despite this de Wet remained in the field, and within a fortnight struck back at the British at the head of 1,500 burghers. Extracted from the book produced by Chris Coulthard-Clark, Where Australians Fought - The Encyclopaedia of Australia's Battles, Allen and Unwin, Sydney, 1998, pp. 87-88. 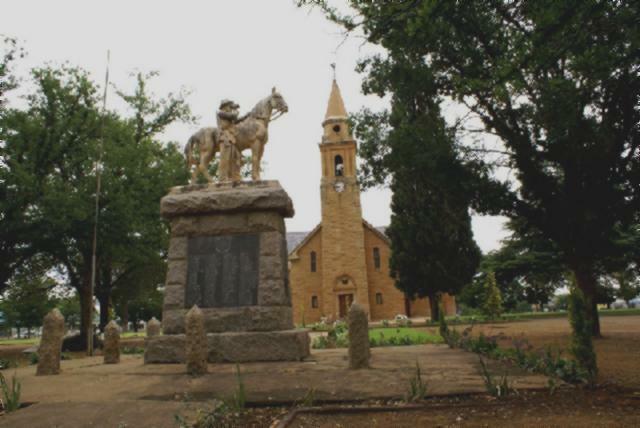 Bothaville, an action during the Second South African War, fought on 6 November 1900 around Doornkraal farm eight kilometres south of this town in the Orange Free State, between a Boer commando under General Christiaan de Wet and British forces commanded by Major-General C.E. Knox. The Times, 9 November 1900, p. 3. THE FIGHTING WITH DE WET. PRETORIA (undated), via Charlestown, Nov. 8. 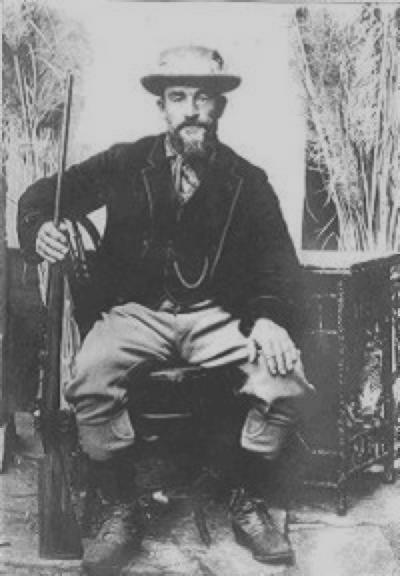 De Wet, who, since his defeat at the hands of Colonels Lisle and Le Gallais, has been lost sight of, is reported to be in the neighbourhood of Rensburg Kop. Further details of the fight have arrived. 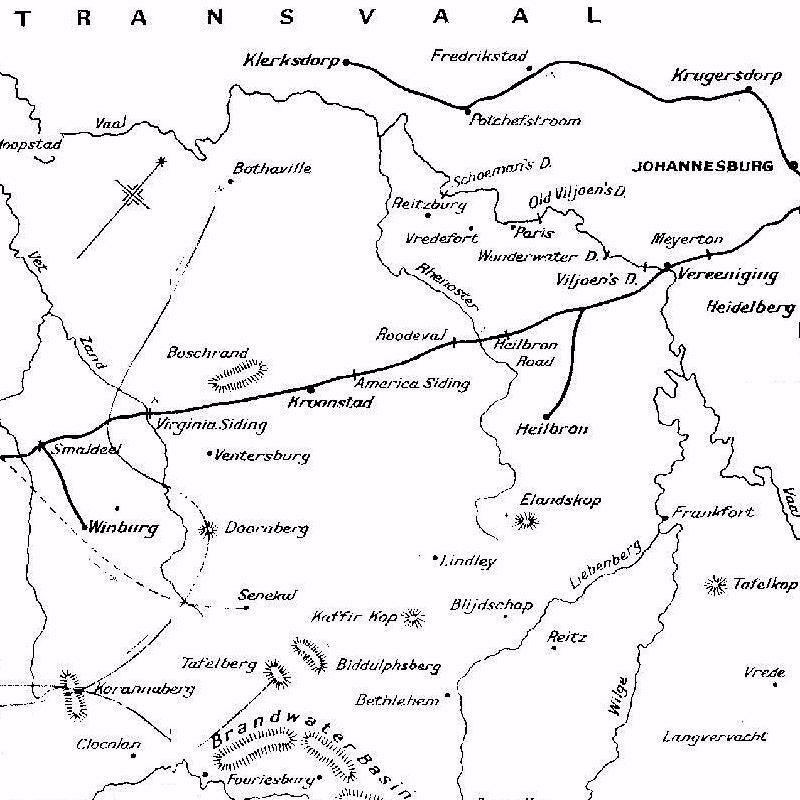 General Snow directed the movement, and the British force marched the whole day, arriving at Rensburg Drift, where De Wet was caught in the act of crossing the Vaal. Colonel De Lisle's troops, which formed the centre, poured a terrible tire into the enemy. Our guns exploded one of the enemy's ammunition wagons and six Boers were blown to atoms. Finally the enemy were obliged to flee, leaving behind them live Krupps guns on which were engraved the words "Free State Artillery." 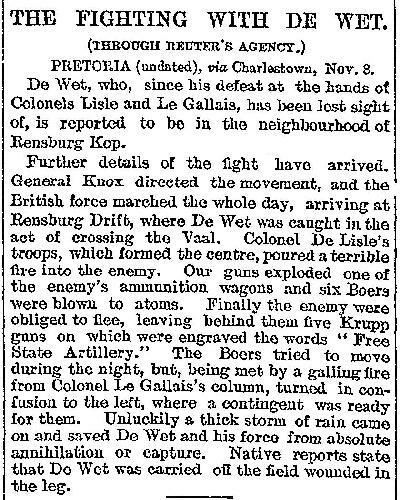 The Boers tried to move during the night, but, being met by a galling fire from Colonel Le Gallais's column, turned in confusion to the left, where a contingent was ready for them. Unluckily a thick storm of rain came on and saved Do Wet and his force from absolute annihilation or capture. Native reports state that De Wet was carried oil the field wounded in the leg. Yesterday morning Colonel Le Gallais had an engagement at Bothaville. The enemy were in force, holding the kopjes on the south side of the town with two guns and a "Pom Pom." The British advance guard engaged the Boers, and the artillery, arriving later, took up a position and shelled the enemy. One or two of our men were wounded, but our casualties have not yet been fully reported. 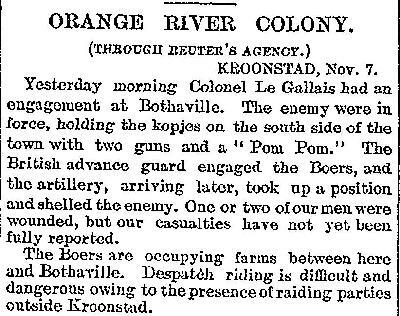 The Boers are occupying farms between here and Bothaville. Despatch riding is difficult and dangerous owing to the presence of raiding parties outside Kroonstad.